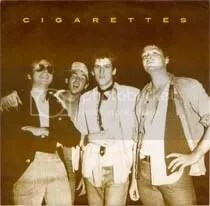 This was released on the crucial S-S label last year and the Cigarettes were rumoured to be a side-project of Sparks, but they did produce a future member of punk legends Fear. Reviews describe them as art-punk, but that is so vague. The title track does sound like Sparks, so I can see the basis for the rumor. The glammy metallic punk sounds right up their alley. It is a damaged piece of punk that is truly unique. “Oh Oh Oh” somehow mixes Sparks with the Talking Heads, but it lacks the presence of a David Byrne.